City of Paris with Union Square and I. Magnin’s. Photo courtesy of Phillippe de Tessan. In 1950, on the 100th anniversary of the City of Paris in San Francisco, company president Paul Verdier wrote a brief history of his family’s store. When gold was discovered in California, Napoleon, who was the President of the French Republic, became Emperor of France. A great many old Republicans resented having to obey a Dictator and many of them who had heard of the discovery of gold in California left France to try and make another fortune in this wonderful new Eldorado. My grandfather, Felix, was one of them but, instead of coming with a pick and shovel, he brought in French wines and liqueurs for the men and laces and silks for their wives and sweethearts. We have original documents dated l851 listing baskets of champagne, casks of rare wines and barrels of brandy, showing that our great-grandfathers certainly were not prohibitionists, and other bills of l853 listing bonnets, Persian shawls, cotton and woolen stockings, petticoats, neck handkerchiefs, laces and silks, proving that our San Francisco ladies from the earliest day were very fashionable dressers. My Grandfather, after sailing from France and crossing the Isthmus of Panama with mule packs, chartered a brig and entered the Golden Gate in the Spring of 1850. Floating from the masthead was a flag bearing the name of the “Ville de Paris” with its crest and motto, “Floats but never sinks,” and this is the name and inspiration with which the City of Paris has been endowed. Felix Verdier, and his brother Emile, a prosperous French merchant who provided the merchandise aboard the Ville de Paris, had planned to open a store in San Francisco immediately, but the goods sold so rapidly from the ship that they had no choice but to sail back to France for more stock. Gaston’s son Paul took over management in 1904 at the age of twenty-three. Two years later, after the earthquake and fire, he moved the merchandise into the beautiful Hobart mansion on Van Ness at Washington. By 1907 the final City of Paris was rebuilt on the Geary and Stockton site. In 1918, Verdier added another block to the property on the corner of Stockton and O’Farrell. The store was designed by architects Arthur Brown and John Bakewell (designers of the War Memorial Opera House and the Veterans Building) with the aid of French architect Louis Bourgeois, all alumni of the Ecole des Beaux Arts of Paris. The lacy grillwork of the City of Paris rotunda, in the style of Louis XVI, gave an open view to all floors. The circular interior was topped by a stained-glass dome depicting the Ville de Paris in full sail. The design created a space large enough to allow for a forty-foot Christmas tree each year, a tree that remained fresh and fragrant in the memory of San Franciscans long after the store was gone. The original stained-glass dome in the City of Paris, still inside the new Neiman Marcus department store on the same location. Paul Verdier managed the store until shortly before his death at the age of eighty-four in 1966. He had joined the City of Paris staff in 1901, after graduating from the University of Paris at nineteen. He returned to France to fight in World War I, where he won two decorations, the Croix de Guerre and Knighthood in the Foreign Legion. He then came back to San Francisco as president of the store at twenty-three - a dashing, water skiing, tennis playing, polo player. When France fell to the Nazis in 1940, Paul Verdier became a United States citizen and perhaps the most prominent leader of San Francisco’s French community. The French government promoted him to Commander, highest rank in the Legion of Honor. He served as Ambassador to the United States from Rumania and Monaco, was a Captain in the State National Guard, and President of the California Palace of the Legion of Honor. Under his guidance branch stores were built in Vallejo, San Mateo, Northgate, and Stonestown, but it was the store on the corner of Geary and Stockton that the city remembered. From the day that gold miners paddled out to the Ville de Paris to buy lacy underwear for their girlfriends, the City of Paris held a unique role in the lives of city shoppers. It was always a hometown store but with a brilliant design and a touch of elegance and savoir faire. Many San Franciscans fought to keep the building intact when the Verdiers no longer managed it. One of the more unusual features of the City of Paris was a street-like department called Normandy Lane. It was unique and set the City of Paris apart from every store in the country. The Lane could have been a setting for “La Bohème” or a Simenon mystery. Its counters were mis-matched, the floors were uneven, and the awning on each booth drooped. But it was rich with the aromas of browning meats and baked breads, and it was an ideal spot for browsing and shopping, like so many small streets in France. To get to the Lane you walked down a short flight of stairs on the O’Farrell Street side of the store. On your right was the French book store, with a tri-color kiosk for children’s books, and then a long stall full of French magazines and novels, dictionaries, and pièces de théâtre. Next came a cigarette and candy booth and then the bustling Normandy Lane tea room. The spécialité de la maison was Tripe à la mode de Caen, served with moist, spicy cinnamon rolls. Back on the O’Farrell Street side, across from the bookstore, was a watch repair shop and a booth for the sale or exchange of rare stamps. Then came the Rôtisserie and the Pâtisserie. Before the days when a barbecue was standard home equipment, customers stopped to enjoy the sight of the chef, in his gros bonnet, tending to the plump chickens sizzling on the spit. Crusty croissants and sticky almond macaroons were the bakery specials. After World War II, with food rationing over, the department offered a picnic box for two, with a disjointed chicken, two salads, and two desserts for $2.25. Tucked away between the kitchen and the Verdier Cellars, Madame Kurtzweil, like Madame de Farge in Tale of Two Cities, sat in her straight-back chair and snipped away at precise, black paper silhouettes. She was proudest of her profile of actor Charles Boyer, but thousands of San Francisco children posed for her and servicemen sent their silhouettes back to their families. At the end of Normandy Lane, with a stairway leading up to the Geary Street entrance, there was a small dark bar which stayed open until seven o’clock. It served as a romantic French rendezvous site for many young working couples. The biggest attraction in Normandy Lane was the Verdier Cellars, which opened on December 6, 1932, the day after Prohibition was repealed. It was one of the most famous cellars in the country and the Tchen-Tchen bar at the entryway was its trademark. Like most French people, the Verdiers had a passion for chinoiserie. The Tchen-Tchen bar was made from an enormous red lacquer bed which had been a family treasure. Behind the Cellars, and known to a select few, was Verdier’s private dining room with its famous circular table. The chief French delegate to the United Nations and the playwright Luis Verneuil would dine there with George Duhamel of the Academie Française. Local politicians and opera stars were on the guest list, too. The Cellars and all of Normandy Lane were authentically French, fashioned under the trained eye of Charles Gassion, who had been born in Caen, Normandy, the son of the city architect. Charles studied with his father and then in Paris until the beginning of the First World War. He joined the army as a sergeant: young Paul Verdier was his Captain. At Verdier’s invitation, Gassion came to America in 1932. Emile Drevoir, who later opened a big liquor store in the avenues, served as the first manager of the Verdier Cellars. Drevoir said of Verdier, “He was fantastic...his whole heart was in that project. He had wines nobody in the city had. He knew more about wines than anybody I ever knew. “Verdier fought to prevent the possible reoccurrence of the ‘curse’ of Prohibition,” Drevoir added. According to Verdier, the thirteen years of Prohibition had set back our wine industry for as many years, during which all other wine-producing countries had made vast improvements. Of 700 wineries in the region in 1920, only 150 were left in 1932. Verdier wrote an educational booklet about wines, explaining which wines came from various areas of France and the correct glass to use with each, but his primary goal was to stir interest in local production. His booklet “California-America Vineyards” tells the story of the wine industry here. An early promoter of California wine, he was the first to buy from the young Souverain winery. The Verdiers bottled some varities under their own private label. Verdier had five or six warehouses on the San Franciscco waterfront, crammed with the finest wines and liquors, and he opened the Cellars in 1933, a wholesale and a retail outlet. Just before World War II, when it became illegal to engage in both operations, Verdier retrenched to retail sales only. The Cellars had an extraordinary inventory with huge allotments from Schenleys and other wine and liquor suppliers. A Verdier Cellar ad from 1942 would make you weep. A bottle of Château Latour Haut Brion, 1925, or of Château Smith-Haut-Lafitte, 1928, sold for $1.45 a bottle. Throughout the war, Normandy Lane was stocked with the best wines of France. 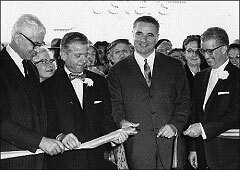 Late in the war, Verdier opened City of Paris branches in San Mateo and Vallejo. Emile Drevoir was put in charge of the Cellars in both stores and he was replaced in San Francisco by George Marie Victoire. Eventually he convinced Verdier of his talents and was rewarded with the management of the Cellars in 1946. Then he went back to Colorado to claim his bride, the late Judge Ollie Marie Victoire. Victoire shared Verdier’s enthusiasm for California wines. The Cellars were changing their early emphasis on French wine and they were also attracting a post-war feminine clientele. Marie Victoire kept a supply of shoe boxes on hand to disguise bottles the women carried home. It was the Count Poom de Ralguine who never allowed the cellar to lose its elegant panache. A close friend of Verdier’s, of Russian descent, Poom de Ralguine was an almost daily fixture at the Tchen-Tchen bar entrance, serving as welcoming host into his nineties, elegantly groomed, always with a carnation in his lapel. The Kiosk and the Book Stall played a large role in Normandy Lane and in the city, during World War II. Renee Leavy arrived in the Lane, like Gassion and Marie Victoire, courtesy of Paul Verdier. Renee was in San Francisco from France, visiting a cousin, when France collapsed in 1940. She had to get a job in order to stay and applied to the City of Paris personnel department. “Your accent is too bad. No one could understand you”, they told her. She tip-toed down the hall to Paul Verdier’s office, left her number and he called her the next day. “Do you have good looking legs?” he asked. In the Salon, they painted Renee’s legs with Nina’s Stocking Film “to create sleek, sun-gold legs,” as the ads promised. Painting one’s legs was a big part of the war effort for thousands of women, because the only alternative was to wear baggy, rayon stockings. The stocking film sold well. Ultimately Verdier decided to open a small kiosk from which to sell French books. He put Renee in charge and soon the red, white, and blue kiosk became as familiar a symbol as the Tchen-Tchen bar in Normandy Lane. Le Petit Prince, Babar en Famille, and Fou Fou Discovers America were best sellers there. The author of Fou Fou, Jean de Boutin, was another French war refugee imported by Verdier. He was a known artist in his own country, but not here, when he arrived in the early 1940s. He moved into the Verdier home, where he wrote the children’s story Fou Fou Discovers America especially for Normandy Lane. In French, with an English translation, the book sold thousands of copies. It was the story of a plucky poodle, a caniche, and his adventures as he flew across America. In the end he died and parachuted down on a white morning glory into – where else? – Paris. Fou Fou silk scarves and records sold almost as well as the book. Because of the success of Fou Fou, Verdier rewarded Renee with an enlarged shop. The kiosk was followed by a long book stall behind which de Boutin painted a Bord-de-la-Seine mural. Throughout the war years, Renee entertained a long series of distinguished guests. Movie star Claudette Colbert ordered Larousse Gastronomique from Renee. Hollywood designer Helen Rose called often for help in designing French costumes. Charles Boyer and Rita Hayworth were regular customers. An album, recorded in French by Boyer, sold well at the shop. “Toujours les Memes”, it was named, “Always the Same.” Boyer told the whole sad history of the endless enmity between France and Germany, tracing back to the wars of 1870 and 1914. And servicemen ordered their Dictionary of French Conversation in the Lane bookstore, not realizing that they were getting ready for a trip to Normandy. Verdier’s sister, the Countesse de Tessan, appeared in the shop each day. She had come to San Francisco, dressed in black, the widow of an underground hero executed by the Nazis. A good deal of charitable work was organized in Normandy Lane. Verdier himself organized a “France Forever” unit. For its benefit Normandy Lane offered handsome solid silver Croix de Lorraine and brilliant tri-color silk scarves. Symphony conductor Pierre Monteux, his wife, and other French families donated valuables to be auctioned in the Lane for the benefit of the Free French. The most notable item was a set of glasses which had belonged to the Tsar. Toward the end of the war, Jeanne Salinger, Director of the Office of French Information, organized the Food for France program for Verdier. With Normandy Lane’s Chef, Victor Faure, she shipped over 50,000 food packages. The City of Paris paid the shipping and sold the food at cost. Jeanne won the Order of Merit from her government for her efforts in the war. She was, incidentally, the mother of young Pierre Salinger, who became John F. Kennedy’s press secretary and, briefly, U.S. Senator for California. Salinger followed in his mother’s footsteps in the 1990s when he became involved in a project called “Wall of Liberty,” to build a memorial in Caen to all Americans who served in Europe. After the Second World War the City of Paris continued to do well, though other downtown stores disappeared one by one: O’Conner Moffitt, Ransohoffs, The White House... One man was largely responsible for the continued stability of the City of Paris during those late years. Italian-born George de Bonis had come to the store in 1914 as a stockboy. He served in many departments, and was elected to the Board of Directors in 1936. His natural talent in interior decorating and his expertise in fine furniture and antiques gave world-wide fame to the store’s home furnishings department.Verdier and de Bonis were good friends, traveling to Europe together and spending time at the Verdier Ranch, Vertes, in Sonoma, with family and often with employees from the store. 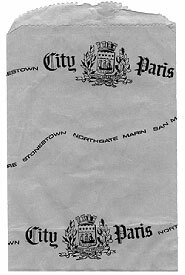 Bag from the City of Paris. When Verdier died in 1966, de Bonis took over as President. When George de Bonis died in June of 1969, the Board of Supervisors adjourned their meeting in his honor. Verdier’s sister Suzanne, the Countess de Tessan, became Administrator. In 1964 her two sons, Phillipe and Henri, arrived from Paris to help in the store, joining their cousin, Paul Chauvin, son of Verdier’s sister Marie, who had come earlier. The Verdier family remained deeply involved in the business until the day the City of Paris closed. By 1972 merchandising everywhere was changing. With Paul Verdier and de Bonis gone, the City of Paris began to fail. The San Mateo, Vallejo, and Northgate branches closed. The Stonestown store became Liberty House, and half of the City of Paris’ downtown property in San Francisco was sold to Broadway Hale. The Texas firm of Neiman Marcus was anxious to buy the original store property, but only if it could tear down the old store. Five years of bitter wrangling followed. 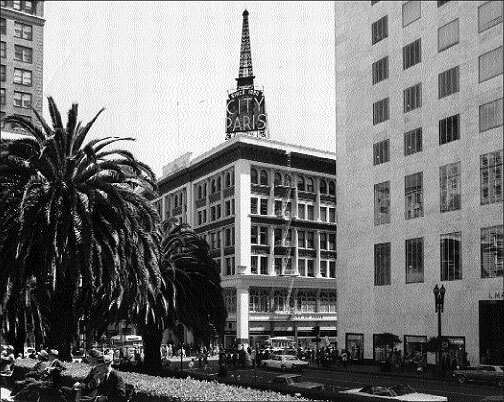 The editor of Preservation News wrote, “In its race to the future, the city is destroying the very qualities that keep it so charming.” The National Trust for Historic Preservation opposed the demolition of the City of Paris building, and hundreds of loyal San Franciscans appeared before the Planning Commission to save it. Lawyer Assemblyman Willie L. Brown, Jr. represented Neiman Marcus; and ultimately Nieman Marcus won, but only because the architect, world-renowned Philip Johnson, conceived a brilliant notion. Chronicle Architectural Editor Allan Temko noted that Johnson’s plan included “salvaging the exquisite sky-lit rotunda of the City of Paris. The lovely rococo plaster decoration of this wonderful space, together with the golden and colored glass of its elliptical dome” would be taken down and re-erected on a new steel frame. 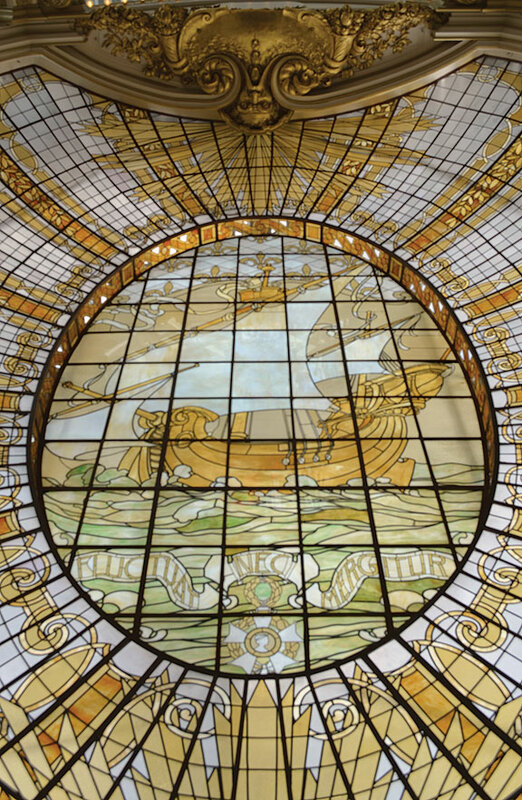 Thanks to Philip Johnson, when you walk through the doors of Neiman Marcus on Geary and Stockton today, looking upward to the stained glass dome you will find the motto and inspiration for the old Ville de Paris, “Fluctuat nec Mergitur.” It floats but never sinks. History of Verdier Family translated from Guide franco-californian du Centenaire by Jeanne Bietry-Salinger. I want to give special thanks to Phillippe de Tessan, son of the Countesse de Tessan and nephew of Paul Verdier, and to Florence Hauser, daughter of George de Bonis, for their personal recollections and photographs. George Marie de Victoire, a native of Caen, contributed his on-the-scene memories of Normandy Lane, Verdier Cellars, and the intimate connection between the City of Paris and war-torn Caen in France. Nora Leishman is a freelance writer in San Francisco. Her article on the Mechanics’ Institute Fairs, 1857 to 1899, appeared in the Fall 1999 issue of The Argonaut.